More Summer dates to be announced soon! For a long time interviewers and X people we've met have asked us did you think when X started you'd still be playing together now? And our answer is surprisingly - No! Of course not! In 1976 I was 20; now I'm 60. How's that for weird?! 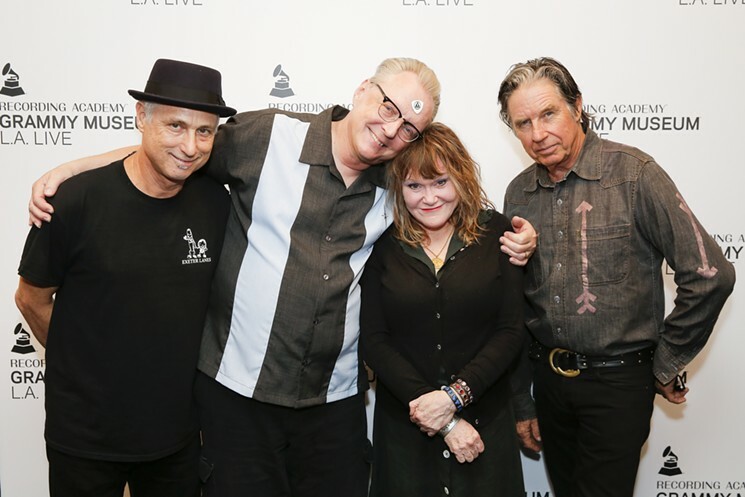 DJ Bonebrake, Billy Zoom, John Doe and Exene Cervenka are STILL together! We are still touring, and guess what? We now have Billy Zoom on saxaphone, DJ on vibes! We added another fine musician, Craig Packham to fill in on drums and rhythm guitar to make that happen. Our harmonies are somewhat perfected, our souls are still in tact, and against all odds, maladies and distractions, all the set backs and obstacles- we are still here! Just some friendly advice- you should probably come see us play while you still have the chance. Not that X is going away anytime soon! A couple weeks ago we were in the van coming home from a show, and started talking about this very exciting 40th Anniversary year coming up. Then Billy said: " That's nice. What are we doing for our 50th anniversary?" Aren't you glad X is still around? I am! Thank You for supporting our kickstarter campaign!